The U.S. is aggressively targeting ISIS in cyberspace, attempting to halt the group's ability to communicate electronically, Secretary of Defense Ash Carter said Thursday. His comments build on those from earlier this week when, for the first time, the Department of Defense admitted to an active offensive cyberspace mission. "There is no reason why these guys ought to be able to command and control their forces," Carter said Thursday morning at a Microsoft-sponsored event in Seattle. 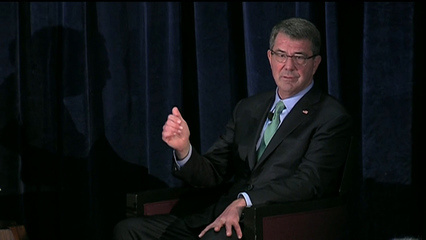 Drawing a parallel with the use of more conventional tools of warfare like missiles, Carter said the attacks are intended to hit the heart of ISIS operations. "We’re using cyber in Iraq and Syria the same way," he said. "Black these guys out. Make them doubt their communications, make it impossible for them to dominate and tyrannize the population in the territory they are and just whack away with this as we are whacking away with everything else. We have to put an end to this fast." The DOS first disclosed its cyberwar operation against ISIS earlier this week, when Carter hinted that one tool being used was a denial-of-service attack. The DOD was trying "to overload their network so that they can't function," he said. Offensive cyberspace operations have been in the DOD toolbox since at least 2013, when a DOD publication noted their use to degrade, disrupt, or destroy access to a particular online system. The DOD also used offensive tools to control or change an adversary’s information systems, it said then. However, recognizing the delicacy of such attacks over public networks, the publication said that any offensive use requires "national level approval." "This is something that's new in this war, not something you would've seen back in the Gulf War," Carter said during a Pentagon briefing on Monday. "It's an important new capability and it is an important use of our Cyber Command and the reason that Cyber Command was established in the first place." Carter's visit to Seattle is part of a West Coast tour that has also seen him stop by tech companies in San Francisco. Since he became secretary of defense a year ago, he's been trying to forge closer links between the DOD and high-tech startups. 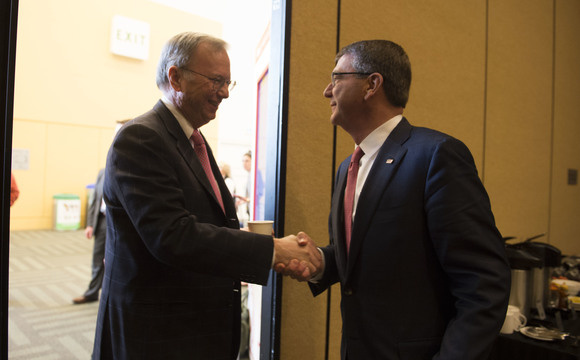 Secretary of Defense Ash Carter meets with former Google CEO Eric Schmidt in San Francisco, March 2, 2016. On Wednesday, the DOD said Eric Schmidt, executive chairman of Alphabet, would chair a new advisory board that brings Silicon Valley thinking to DOD problems. The department also laid out plans to invite cybersecurity experts to examine its public website as part of the federal government's first bug bounty program. Later Thursday, Carter is due to visit Microsoft's cybersecurity control center.